The purpose of this Site is for providing general information about Tawreeq SCF Investments and its products and services, and it does not constitute the sale or marketing of securities or financial products and services. By accessing, viewing, or using this Site, including all content made available through the Site, you, the User, indicate that you understand and intend these Terms and Conditions to be the legal equivalent of a signed, written contract and equally binding, and that you accept these Terms and Conditions and agree to be legally bound by them. Please note that Tawreeq SCF Investments reserves the right to change these Terms and Conditions under which this Site and its many offerings are extended to you. Your continued use of this Site following reasonable notice of such modifications will be conclusively deemed acceptance of any changes to these Terms and Conditions. This Agreement provides you, the User, with a personal, revocable, nonexclusive, non-transferable license to use this Site conditioned on your continued compliance with these Terms and Conditions of this Agreement. You may not modify, copy, distribute, broadcast, transmit, reproduce, publish, mirror, frame, license, transfer, sell or, other than for personal, non-commercial use, use any information or material obtained from or through this Site without the prior written consent of Tawreeq SCF Investments. As a further condition of use of this Site, all Users warrant to Tawreeq SCF Investments that they will not use this Site for any purpose that is unlawful or otherwise prohibited by these Terms and Conditions. 2.1 All content contained on this Site, unless otherwise indicated, is protected by law including, but not limited to, Luxembourg copyright, trade secret (for any password protected areas, if any), and trademark law, as well as other state, national, and international laws and regulations. Except as expressly provided herein, Holdings does not grant any express or implied right(s) to Users of this Site. Please be aware that Tawreeq SCF Investments actively and aggressively enforces its intellectual property rights to the fullest extent of the law. The contents of this Site are Copyright © 2015 Tawreeq SCF Investments. All Rights Reserved. Removing or altering the copyright notice on any content on this Site is prohibited. Tawreeq SCF Investments also owns a copyright in the content and in Site as a whole, as a collective work, and/or compilation, and in the selection, coordination, arrangement, and enhancement of this Site’s content. 2.2 The following trademarks: TAWREEQ SCF INVESTMENTS, TAWREEQ SCF INVESTMENTS Plus Design, and all other names, logos, and icons identifying Tawreeq SCF Investments and/or Tawreeq SCF Investments’ products and services are proprietary marks of Tawreeq SCF Investments. Other product and company names mentioned herein may be the trademarks of their respective owners. Your use of certain portions of this Site may require a password. As part of the registration process, you must select a user name and password and provide Tawreeq SCF Investments with accurate, complete and up-to-date information. Anyone with knowledge of your password can gain access to the restricted portions of this Site and the information available to you. Accordingly, you must keep your password secret. By agreeing to these Terms and Conditions, you agree to be solely responsible for the confidentiality and use of your respective password, as well as for any communications entered through the Site using your password. You will also immediately notify Tawreeq SCF Investments if you become aware of any loss or theft of your password or any unauthorized use of your password. Tawreeq SCF Investments reserves the right to delete or change a password at any time and for any reason. (j) Modify, adapt, sublicense, translate, resell, retransmit, reverse engineer, decompile or disassemble any portion of the Site. Tawreeq SCF Investments also welcomes your feedback and suggestions about how to improve our products and services and this Site. Any ideas, suggestions, information, know-how, material, or any other content (collectively Feedback) received through this Site, however, will be deemed to include a worldwide, royalty-free, perpetual, irrevocable, nonexclusive right and license for Tawreeq SCF Investments to, in whole or in part, adopt, publish, reproduce, disseminate, transmit, distribute, copy, use, create derivative works, display, or act on such Feedback without additional approval or consideration, in any form, media, or technology now known or later developed for the full term of any rights that may exist in such feedback, and User hereby waives any claim to the contrary. Further, Tawreeq SCF Investments is free to use any ideas, concepts, know-how, techniques, and suggestions contained in any communications you may send to this Site for any purpose whatsoever including, but not limited to, creating and marketing products and/or services using such information. Tawreeq SCF Investments reserves the right to view, monitor, and record activity on the Site without notice or permission from you. Any information obtained by monitoring, reviewing, or recording could be subject to review by law enforcement organizations and data protection agencies in connection with investigation or prosecution of possible criminal or other illegal activity on the Site. Tawreeq SCF Investments reserves the right to comply with all court orders, subpoenas, warrants, or other regulatory or administrative requests for such information. Tawreeq SCF Investments, in its sole discretion, may post the advertisements of third parties on this Site. A User’s correspondence or any other dealings with advertisers found on this Site are solely between the User and such advertiser. Users agree that Tawreeq SCF Investments shall not be responsible for any loss or damage of any sort incurred as a result of any such dealings or as the result of the presence of such advertisers on this Site. Moreover, Users shall not knowingly or intentionally interfere with the display of such advertisements. Tawreeq SCF Investments may provide links, in its sole discretion, to other sites on the Internet for the convenience of its Users in locating related information and services. These sites have not necessarily been reviewed by Tawreeq SCF Investments and are maintained by third parties over which Tawreeq SCF Investments exercises no control. Accordingly, Tawreeq SCF Investments expressly disclaims any responsibility for the information collection practices, the content, the accuracy of the information, and/or quality of products or services provided by or advertised on these third-party web sites. Moreover, these links do not imply an endorsement with respect to any third party or any web site or the products or services provided by any third party. Users expressly absolve and release Tawreeq SCF Investments from any claim of harm resulting from a cause beyond Tawreeq SCF Investments’ control including, but not limited to, failure of electronic or mechanical equipment or communication lines, telephone or other interconnect problems, computer viruses, unauthorized access, theft, operator errors, severe weather, earthquakes, or natural disasters, strikes or other labour problems, wars, or governmental restrictions. 11.2 WHILE TAWREEQ SCF INVESTMENTS ENDEAVORS TO PROVIDE THE MOST ACCURATE, UP-TO-DATE CONTENT, INFORMATION, MATERIALS AND FUNCTIONS AVAILABLE, THE CONTENT, INFORMATION, MATERIALS, AND FUNCTIONS AVAILABLE ON THIS SITE MAY INCLUDE INACCURACIES OR TYPOGRAPHICAL ERRORS. MOREOVER, TAWREEQ SCF INVESTMENTS MAY MAKE MODIFICATIONS AND/OR CHANGES IN THIS SITE OR IN THE CONTENT, INFORMATION, MATERIALS, AND FUNCTIONS AVAILABLE ON THIS SITE AT ANY TIME, FOR ANY REASON. 11.3 YOU, THE USER, ASSUME THE SOLE RISK OF MAKING USE OF, AND/OR RELYING ON, THE CONTENT, INFORMATION, MATERIALS AND FUNCTIONS AVAILABLE ON THIS SITE. TAWREEQ SCF INVESTMENTS MAKES NO REPRESENTATIONS ABOUT THE SUITABILITY, COMPLETENESS, TIMELINESS, RELIABILITY, LEGALITY IN YOUR JURISDICTION, OR ACCURACY OF THE CONTENT, INFORMATION, MATERIALS AND FUNCTIONS AVAILABLE ON THIS SITE FOR ANY PURPOSE. ALL SUCH CONTENT, INFORMATION, MATERIALS, AND FUNCTIONS ARE PROVIDED “AS IS” WITHOUT WARRANTY OF ANY KIND, INCLUDING ALL IMPLIED WARRANTIES AND CONDITIONS OF MERCHANTABILITY, FITNESS FOR A PARTICULAR PURPOSE, TITLE, AND NONINFRINGEMENT. 11.4 IN NO EVENT SHALL TAWREEQ SCF INVESTMENTS BE LIABLE FOR ANY INDIRECT, PUNITIVE, INCIDENTAL, SPECIAL, OR CONSEQUENTIAL DAMAGES ARISING OUT OF OR IN ANY WAY CONNECTED WITH THE USE OF THIS SITE, INCLUDING ANY CONTENT, OR WITH THE DELAY OR INABILITY TO USE THIS SITE, OR FOR ANY CONTENT, INFORMATION, MATERIALS, AND FUNCTIONS AVAILABLE ON THIS SITE, OR OTHERWISE ARISING OUT OF THE UTILIZATION OF THIS SITE, WHETHER BASED IN CONTRACT, TORT, STRICT LIABILITY, OR OTHERWISE, EVEN IF TAWREEQ SCF INVESTMENTS HAS BEEN ADVISED OF THE POSSIBILITY OF DAMAGES. AS A RESULT OF SOME JURISDICTIONS NOT ALLOWING THE EXCLUSION OR LIMITATION OF LIABILITY FOR CONSEQUENTIAL OR INCIDENTAL DAMAGES, THE ABOVE LIMITATION MAY NOT APPLY. 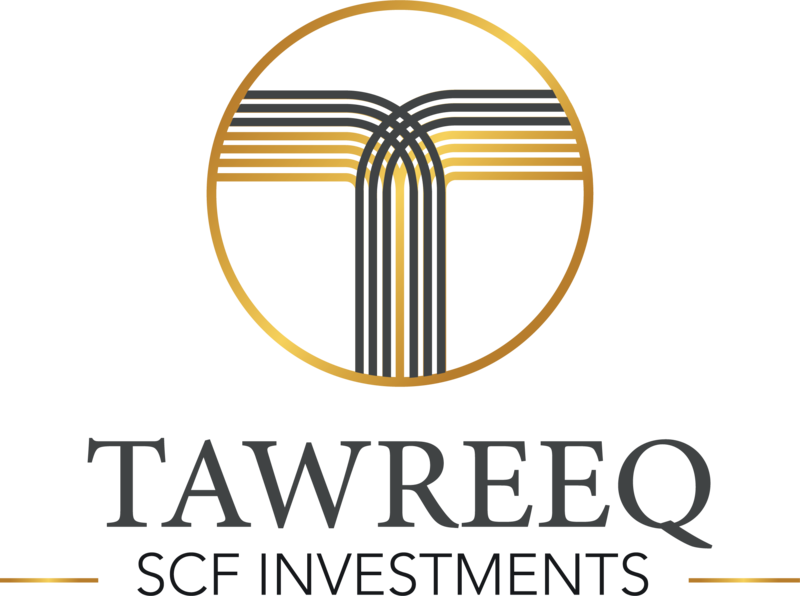 NOTWITHSTANDING THE FOREGOING, TOTAL LIABILITY OF TAWREEQ SCF INVESTMENTS FOR ANY REASON WHATSOEVER RELATED TO USE OF THIS SITE, INCLUDING ANY CONTENT, SHALL NOT EXCEED THE TOTAL AMOUNT PAID BY USER TO TAWREEQ SCF INVESTMENTS IN CONNECTION WITH THE SUBJECT MATTER OF THE PARTICULAR DISPUTE. You agree to defend, indemnify, and hold harmless Tawreeq SCF Investments and its affiliates and all of their employees, agents, directors, officers, proprietors, partners, representatives, shareholders, servants, attorneys, predecessors, successors, and assigns, from and against any and all claims, proceedings, damages, injuries, liabilities, losses, costs, and expenses (including reasonable attorneys’ fees and litigation expenses), relating to or arising from your use of the Site or any breach by you of this Agreement. You agree to cooperate as fully as reasonably required in Tawreeq SCF Investments’ defence of any claim. Tawreeq SCF Investments reserves the right, at its own expense, to assume the exclusive defence and control of any matter otherwise subject to indemnification by you and you shall not in any event settle any matter without the written consent of Tawreeq SCF Investments. This Agreement will take effect at the time the User begins using this Site (thereby indicating acceptance of these Terms and Conditions). Tawreeq SCF Investments reserves the right at any time and for any reason to deny any User access to the Site or any portion thereof, and to terminate this Agreement. Termination will be effective without notice. Failure to insist on strict performance of any of these Terms and Conditions of this Agreement will not operate as a waiver of any subsequent default or failure of performance. No waiver by Tawreeq SCF Investments of any right under these Terms and Conditions will be deemed to be either a waiver of any other right or provision or a waiver of that same right or provision at any other time. If any provision of these Terms and Conditions is held to be illegal, invalid or unenforceable under any present or future law, and if the rights or obligations of any party hereto under these Terms and Conditions will not be materially and adversely affected thereby, (a) such provision will be fully severable, (b) these Terms and Conditions will be construed and enforced as if such provision had never comprised a part hereof, (c) the remaining provisions of these Terms and Conditions will remain in full force and effect and will not be affected by such provision or its severance herefrom and (d) in lieu of such provision, there will be added automatically as a part of these Terms and Conditions a legal, valid and enforceable provision as similar in terms to such provision as may be possible. No joint venture, partnership, employment, or agency relationship exists between a User and Tawreeq SCF Investments as a result of this Agreement or User’s utilisation of this Site. This Agreement has been made in, and will be construed and enforced in accordance with the laws of the Luxembourg as applied to agreements entered into and completely performed in Luxembourg. Any action to enforce this Agreement will be brought in the courts presiding in Luxembourg, and all parties to this Agreement expressly agree to be subject to the jurisdiction of such courts. This Site is controlled and operated by Tawreeq SCF Investments from its offices within Luxembourg. Tawreeq SCF Investments makes no representation that materials in the Site are appropriate or available for use in other locations, and access to them from territories where any of the contents of this Site are illegal is prohibited. Those who choose to access this Site from other locations do so of their own volition and are responsible for compliance with applicable local laws. A cookie is a small file of letters and numbers sent by a website to your computer or mobile device where it is stored by the User’s browser if the User agrees. Cookies contain information which enable a website to recognize the User as he/she moves around the site and/or each time the User revisits. Cookies may be sent by the website that the User is visiting or by another organization which provides services to that website, such as an advertising network or analytics company. Analytical/performance cookies. They allow Tawreeq SCF Investments to recognize and count the number of visitors and to see how visitors move around the Site when they are using it. This helps Tawreeq SCF Investments to improve the way its Site works, for example, by ensuring that the User is finding what he/she is looking for easily. Functionality cookies. These are used to recognize the User when he/she returns to the Site. This enables Tawreeq SCF Investments to personalize its content for the User, greet the User by name and remember the User’s preferences (for example, the User’s choice of language or region). Targeting cookies. These cookies record the User’s visit to Tawreeq SCF Investments’ Site, the pages the User has visited and the links the User has followed. Tawreeq SCF Investments will use this information to make its Site and the advertising displayed on it more relevant to the User’s interests. Tawreeq SCF Investments may also share this information with third parties for this purpose.